1 Rinse apples, then peel, quarter, core and dice. 2 Halve the lemon and squeeze out the juice. 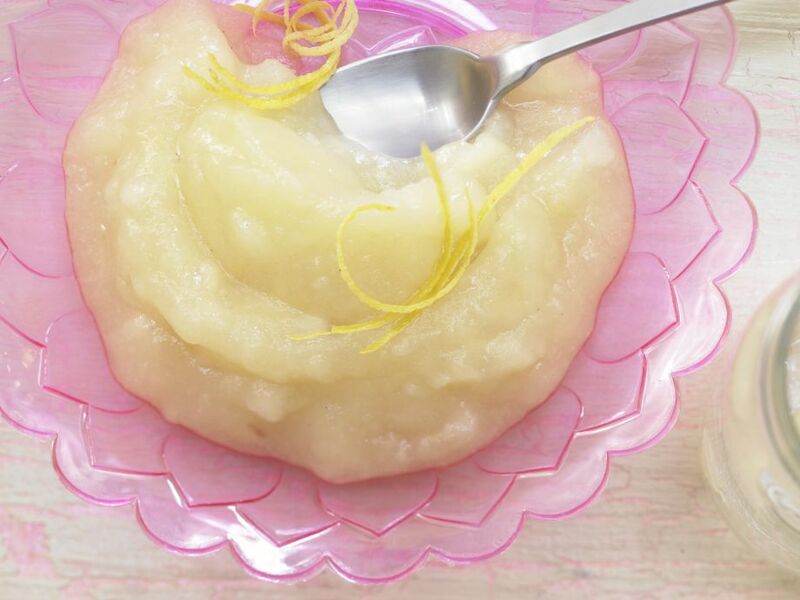 3 Combine the diced apples with lemon juice to taste, 2 tablespoons water and sweetener in a pot. Bring to a boil, then cover and cook over medium heat until soft, 15-20 minutes. 4 Meanwhile, rinse 3 screw-top jars with lids in boiling water and leave upside down to dry on a kitchen towel. 5 Puree the apple mixture in the pot with an immersion blender until smooth. 6 Boil the applesauce again and pour into the prepared jars (they should be filled to the brim). Immediately seal the lids and let jars stand upside down for 5 minutes, then set upright again and store at room temperature until ready to serve. Refrigerate after opening.